Water 4 Elephants contains blue and green glitters in various sizes and color shifting pigment all in a gray creme base. All nails are 4 coats with a top coat of Seche Vite. Zomboy has a deep purple jelly base with color shifting glitter with blue and raspberry pink holographic glitters in various sizes. I used 3 coats with a top coat of Seche Vite. 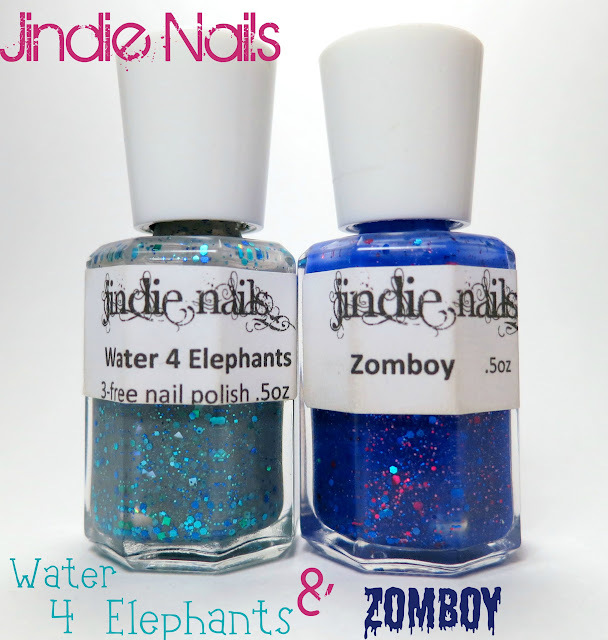 Jindie Nails can be purchased through Etsy (though she is currently closed), Ninja Polish and Mei Mei's Signatures. I'm not sure if these colors are both sale anymore >_< sorry if they aren't! You can follow Jindie Nails on Facebook and Instagram.